Is the ‘mother of all defense deals’ finally dead? Indian Defense Minister Manohar Parrikar confirmed on Sunday that India will only purchase 36 instead of 126 Rafale fighter jets from France, an announcement that appears to finally bury the much hyped “mother of all defense deals” for good. The 126 Rafale aircraft are “way too expensive” and “economically unviable and not required,” the defense minister told local press over the weekend. Purchasing the fighters would have been “a very steep slope to climb financially (…) we are not buying the rest. We are only buying the … 36,” Parrikar added. According to Indian press reports, the price tag for the now-scrapped $20 billion MMRCA (medium multi-role combat aircraft) project went up “2.7 times” from the original cost proposal. Initially, the MMRCA project envisioned that India’s Hindustan Aeronautics Limited (HAL) would build 108 out of a 126 total Rafale jets locally, with the first batch of 18 fighter jets directly delivered from France in flyaway condition. However, New Delhi unexpectedly announced in April of this year that it would only purchase 36 French-made Rafale fighters instead of the original 126. The announcement came as a severe shock to several Indian defense analysts and the Indian Air Force, which has been plagued by a poor procurement process for decades that has resulted in diminished operational readiness (see: “Indian Air Force Still Plagued by Poor Procurement Process“). 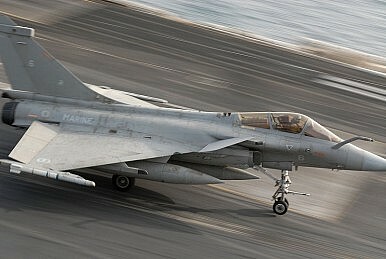 As I reported last week, Germany had consistently lobbied against the purchase of the Rafale aircraft and — among other things — pointed out to New Delhi that the Rafale would only be the cheaper solution to the Eurofighter Typhoon multirole fighter if one excludes maintenance and future upgrade costs from the financial calculations. These lobbying efforts might perhaps be paying off now as India is reconsidering the Eurofighter option (see: “Will India Purchase German Stealth Submarines?”). The price tag for the 36 off-the-shelf Rafale will substantially be cheaper since France is no longer obligated to build the planes in India. “In the MMRCA tender, Dassault was to supply 18 Rafales in flyaway condition, and also build 90 fighters in Hindustan Aeronautics Ltd (HAL). Now Dassault is freed of the responsibility to ‘Make in India’. The price they now supply the Rafale at should not just be lower, but at least 30-35 per cent lower than the price which included ‘Make in India,'” an expert noted. However, the current contract under negotiation includes a offset clause which stipulated that France will have to invest 50 percent of the contract value as offsets in India. Final negotiations are supposed to conclude in two to three months, with the planes scheduled to be delivered over the next two years. The Indian Air Force is currently down to 35 current active fighter squadrons, which is seven below the sanctioned strength of 42. The purchase of 36 Rafale figher jets is a stopgap solution to overcome some the critical shortages facing the IAF, as highlighted in a parliamentary committee report in April 2015. “The direct acquisition of 36 Rafales is based on the IAF’s critical operational requirement. What is the final offer at the end of the discussions, it will be considered then. I will not like to comment at this stage… let the discussions come to some conclusion,” the defense minister said on Sunday.